This ruler will help you draw lines that radiate out from a central point. This can be used to draw speed lines, which are often used in illustration to give a sense of motion or action. It has one Curve parameter that will let you create curved radial lines. These are simple quadratic curves. The center point can be moved around by dragging the control point. Holding the control key will also show the curve control point. ds - The distance in pixels from the start position to the center. d - The distance in pixels from the start position to the current position (will be negative when drawing away from the center). dn - The normalized distance from the current position to the center: 1 at the start position, 0 at the center. These variables can help you write scripts that have effects as you get closer or further away from the center. Here's the Radial Fade script mode in action. This script will automatically attenuate the pressure of your stroke as it approaches the center. 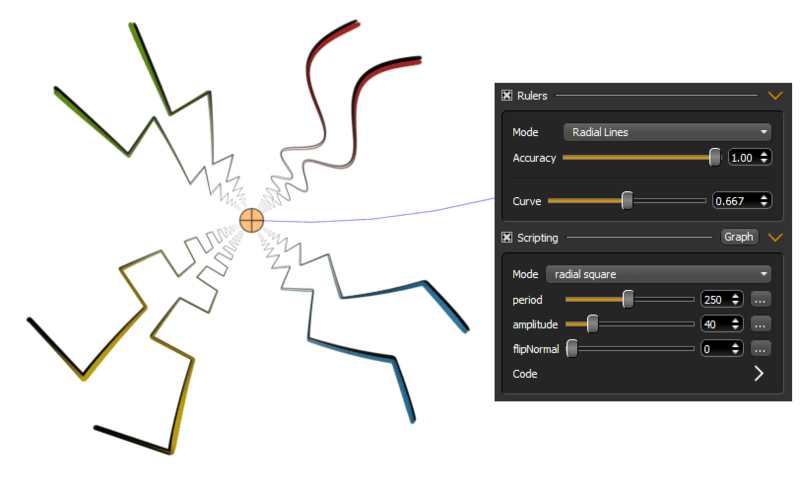 Be sure to try the other script modes in the Radial Patterns section! They are special versions of the basic pattern scripts that attenuate the size of the shape as you get closer to the center.